At Loughner Massage & Lash Boutique we allow you to choose the amount of sessions you would like per sitting. Each session takes 15-20 Minutes. Most people will not see drastic results without at least 2 sessions which is why we have included a second session for FREE! Results vary from person to person depending on how stained the teeth are before whitening, what caused the stains on the teeth, and how well the persons enamel reacts to the peroxide in our gel. But to give you an idea.... one treatment can provide 2-4 shades of whitening, 2 treatments can provide up to 8 shades of whitening, and 3 & 4 treatments can provide above 8 shades of whitening! THREE consecutive sessions for only $99! Book between the hours of 11am- 4pm Monday-Friday and get an additional $10 off! *specials may expire at any time so don't miss out! The Beaming White® Home Whitening Kit is our most popular kit. Many of the foods and drinks you consume throughout the day stain your beautiful teeth (coffee-drinkers, unite!). Fight back and reclaim your confident, sparkling-white smile with this safe and effective kit! If you’re looking to safely and dramatically whiten your teeth at home, the Beaming White® Deluxe Home Whitening Kit is the best home teeth whitening product on the market. Get your kit today for a fraction of what a dentist would charge for a teeth whitening treatment—you know you deserve it! Minerals™ Enamel Booster is a great tasting remineralizing and desensitizing gel. Remineralizing gel significantly increases the micro-hardness of tooth enamel after teeth whitening which helps seal in the whitening results by sealing out stains. It replenishes minerals such as fluoride and calcium which are lost over time, but especially after a teeth whitening treatment. It also helps to prevent and alleviate tooth sensitivity. 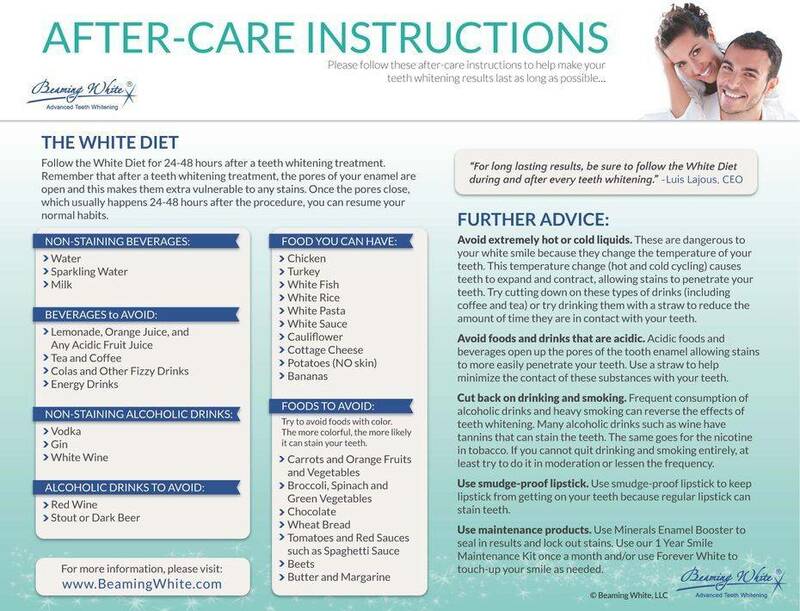 We use a gel (16% hydrogen peroxide) that whitens the teeth and a blue LED light which accelerates the process. This is a safe treatment and generally has no sensitivity to the teeth and gums. Also, as opposed to using a gel tray, you will 'paint" the gel on your teeth which helps prevent the gel from touching your gums and prevents sensitivity. After a teeth whitening treatment, the pores generally remain open for around 24 hours. We recommend 2 or 3 consecutive treatments per customer. If you don’t want to, or can't, have all the treatments during the same visit, you can have come back for the next session the following day while the pores are still open, but it really needs to be within 24 hours of the prior treatment. -Have poor enamel or decalcification caused by excessive use of fluorides. -Wear braces or have worn braces in the past 6 months. -Have recently had oral surgery. -Have decaying teeth or exposed roots. -Have a history of allergic reaction to peroxide products. -Have silver filings in, near, or behind the front teeth. -Are under the age of 14.